Application in plastics industry-Zhang Jiang Automation (Jiangsu) Co.Ltd. High speed plastic mixing production line. The production line mainly contains Automatic Multi-ingredient Formula Weighing System, high-speed mixer, cold mixer, power vacuum feeder, and extruders. 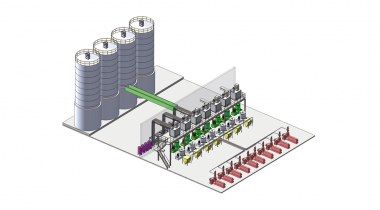 It can be combined with Mixing Workshop Information Management System to realize information control of whole production line and production process.